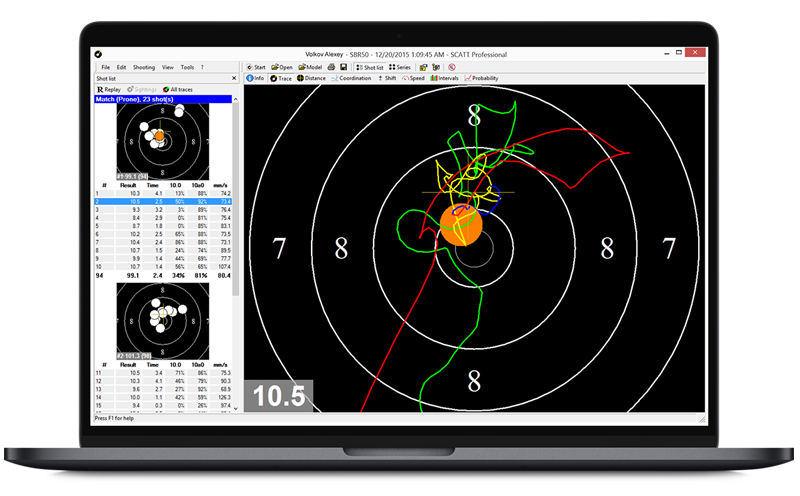 The feature-rich and easy-to-use SCATT Professional software has all the necessary features for efficient training and overall analysis of shooting results. Results are displayed in both digital and graphic forms and can be saved onto disk for further analysis (aim trajectory, shots and graphics, etc). All major sport and military targets are included in the program. Depending on the model of electronic target used, this program can imitate distances up to 1000 meters. At the same time it is even possible to print off the desired target in the required scale, directly from the program. The trajectory sections are highlighted in different colors (default settings: aim before shooting – green, one second before shooting – yellow, after shooting – red). You can easily change the colors of the trajectory sections, as well as add supplementary colors. The program automatically repeats the aiming trajectory right after the shot is fired, as whilst aiming, the shooter is unable to watch the computer display. Target’s centre distance – this analysis is represented by two graphs. The first one depicts the distance from the aiming trajectory’s points to the target’s centre, both vertically and horizontally. The second graph shows absolute deflection of the trajectory’s points from the centre of the target. Both graphs provide the information about the same shot. Coordination - graph depicts the absolute deflection of the trajectory’s points from the centre of the target (see above), including the entire number of shots fired during the training session. It is one of the most important indicators of the shooter’s coordination. It highlights loss of control over the weapon in the last moments before firing. The term co-ordination means the ability of the shooter to choose the optimal moment of shot release within his ( her ) ability of holding steadiness. This is one of the most important criteria by which the shooter’s ability as a competitor can be judged. This ability to choose an optimal moment of final shot release can partly compensate for insufficient steadiness. Co-ordination is analyzed by averaged curve of the values of , It is plotted in some time interval prior to the shot. The value of R(t), and in particular the character of the change (increase or decrease) in the final 0,2-0,3 second, are characteristic of the degree of co-ordination ability of the shooter. The faster the R(t) value grows in last 0,2 second, the lower the shooter’s co-ordination ability, i.e. more likely the aiming of the rifle or pistol becomes worse in the final moment of triggering. Shift of shooting moment – this graph not only shows the result of the shooting at the moment of firing, but also it can be compared with the possible result, if firing had occurred a fraction of a second earlier. Speed of aiming trajectory – this graph represents the speed of the trajectory’s movement on the target, effectively measuring a shooter’s steadiness. It is a very useful graph for analysis of the steadiness and of shooting between heartbeats. Intervals between the shots – this diagram illustrates the best timing points of the each shot and time intervals between them. Based on this data, a shooter can select his/her optimum shooting pace. Result probability – provides possible results of a shooter, if he/she uses a weapon and ammunition of a different quality. All data is automatically recorded in a folder, where training files are grouped according to the name of the exercise and last name of the shooter. This data is then organized in such a way as to make it convenient to search for. It is even possible to exchange files, or send them to any person, for example, to a coach living in a different location to the shooter.